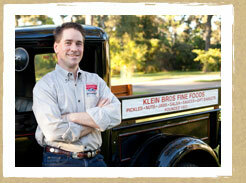 The Klein family has been part of Texas and its history for generations. In 1854, German Lutheran immigrant Adam Klein and his wife, Friederika, purchased a farm on the prairie north of Houston near Spring Creek in the area known today as the Klein Community. 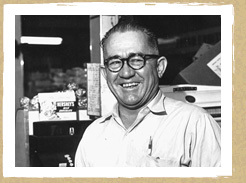 In 1922, Adam’s grandson and my grandfather, Alec (A.B), left the family farm to found Klein Bros. General Merchandise. 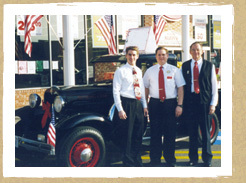 With Alec’s (A.B) knowledge of food and farming, Klein Bros. soon became known for selling the finest farm fresh foods with superior customer service. Alec’s son and my dad, Robert, joined Klein’s in 1956 and built it into one of the state’s premier independent supermarkets. Now in the third generation, I expanded the family business to include the wholesale distribution and internet sales of the Klein Bros. specialty line of products that our customers have enjoyed for years. I look forward to continuing the tradition of selling farm fresh products with superior customer service established by my ancestors. Many of our customers ask us if the truck in our logo really existed. The answer is, yes, and we wanted our logo to speak to our company’s history and philosophy. The truck in our logo is based on the type of Model A truck that my grandfather, Alec, drove to the produce markets of Houston in the 1920’s and 1930’s to gather the freshest produce and goods possible. Many times, by the afternoon, his customer’s products were often personally delivered to their doorstep. While we can’t personally deliver to each of our customers today, we still uphold his philosophy of freshness and superior customer service, which we seek to provide to every customer we encounter. My father, Robert, now owns a 1931 Model A truck just like the one his father drove. This is the truck you see pictured in our advertising today. We hope that when you see this truck, you will remember that there is a little bit of Texas history in every product you purchase from Klein Bros.
Jeffrey Klein is a fifth generation Texan and the third generation of the Klein family to be involved in the food business. Growing up, he worked in his family’s supermarket in Tomball sacking groceries, stocking shelves, and learning the business along the way. Jeffrey carried these skills to college when he entered Texas A&M University and studied Business Management with an emphasis on entrepreneurship and small business management. While at A&M he toured the state as part of the nationally famous Texas A&M Singing Cadets. Upon receiving his A&M business degree with honors in 1992, Jeffrey returned to Tomball to work full-time with his father, Robert, in the family grocery business. Several years ago the idea occurred to him that all Texans and those who love Texas should have the opportunity to experience the finest in Texas foods, which he’s been selling to his own customers for years. The Klein family’s roots run deep in Texas. With that heritage, knowledge of the food industry, and vast love of Texas and its history, Jeffrey and his wife, Traci are uniquely qualified to bring these exceptional Texas foods to your doorstep today.